From the group's July 13 performance at the San Jose Obon Festival. – I’m currently back at SJSU in the teaching credential program to be a high school English teacher. Yes, I left a poverty-inducing career where getting laid off is a possibility, to enter another poverty-inducing career that is also in danger financially. But what isn’t these days? – And last, I love photography. I take photos around San Jose all the time, so I’m making it a mission to bring photos to each of my entries, starting with this one! OK, enough about me. What I really want to tell you all about is the Spirit of Japantown Festival that is planned for next Saturday, Oct. 4. As a Japantown resident, I love telling people how much I love it here and how they should come by and check out some of the delicious food. Sushi Maru is my personal favorite, but Japantown has lots to offer. The Spirit of Japantown Festival will go from 10 a.m. to 6 p.m. in the heart of Japantown (Jackson and Fifth streets) and will be packed with activities for people of all ages. Shoppers will enjoy the Main Street full of Japanese fine arts, crafts, food for sale, as well as wares from other local merchants. Festival-goers will be able to enjoy entertainment that ranges from a hula to bellydancing on the Main Stage (Jackson Street between Third and Fourth streets), as well as Martial Arts demonstrations, free Anime movies, and other activities for kids. The San Jose Taiko group is scheduled to perform on the Main Stage, and I have to say they are a must-see. I’ve watched the group perform at the last two San Jose Obon Festivals and they are phenomenal. While there is usually plenty of street parking in the area, during festivals, the streets fill up fast. However, those who are lightrail savvy will be interested to know that the Japantown/Ayer stop is just a few blocks away from the action. The stop is on First street near Jackson, so just a quick walk and riders can be in the heart of the action. So if you’re interested, I’m sending you a personal invitation to my neighborhood to enjoy all it has to offer. See you at the festival! 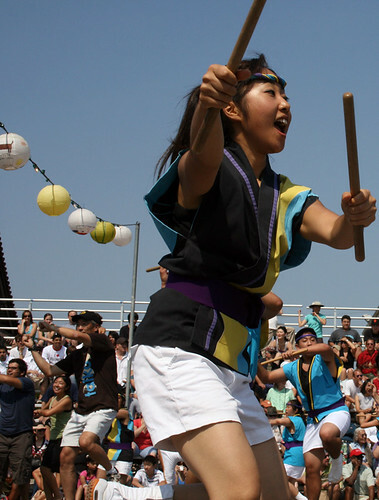 For more information about the Spirit of Japantown Festival, visit their website.